People with celiac disease or gluten sensitivities can suffer an adverse reaction from contact with even trace amounts of gluten. To ensure their gluten-free clients are safe from cross contamination, trusted catering teams employ the best practices in gluten-free catering. With this approach, they can serve both gluten-friendly and gluten-free dishes to ensure your guests have a pleasant and inviting dining experience at your corporate event. You can better understand how corporate catering teams accomplish this feat by exploring the best practices in more detail below. Food manufacturers change their ingredient lists all the time, adding and removing gluten without obvious rhyme or reason. The addition of gluten products does not always change the color or consistency of the foods either. Therefore, catering teams take the review of ingredient labels very seriously when prepping and cooking gluten-free menu items. Simply looking for the gluten-free stamp is not enough, as the regulations for those labels are rather loose at this time. With a thorough review of the ingredient list, however, it is possible to verify the lack of gluten in the product, indicating it is a safe choice for the gluten-free dish. With the potential for tiny gluten particles to cause immense problems, catering teams always utilize separate work areas and tools for their gluten-free food prep. Just washing the tools between uses does not provide enough protection from cross contamination. Instead, the catering teams have dedicated pots and pans, cutting mats, knives and other tools for their gluten-free cooking needs. The teams also keep gluten-free food prep to a dedicated area that never sees exposure to gluten. The food prep and cooking areas are not the only places where cross contamination with gluten can occur. The gluten contamination can also happen when storing and transporting the catered menu items. To reduce this risk, skilled catering professionals only use the highest quality storage containers for the transport of ingredients and prepped foods. Separate transport procedures help keep the items from getting mixed up along the way and eliminates the risk of cross contamination during traveling. Catering teams must create an effective plan of action to utilize these safe and separate transport practices while remaining on schedule. With the accurate labeling of all ingredients, prepped foods and cooked dishes, catering teams can keep gluten from coming into contact with gluten-free surfaces, tools and ingredients. The labels should clearly indicate the status of the items inside for easier sorting and processing upon arriving at the venue for the corporate catered event. To quickly and accurately create the labels, catering teams often have a convenient label maker on hand in the kitchen and in the transport vehicles that go to the corporate catered events. Gluten-free individuals at your corporate catered events can remain protected from cross-contamination when you partner with a skilled and experienced catering team. You will need to verify that the team takes the prevention of gluten contamination seriously throughout every phase of the catering process. You can inquire about the usage of the best practices above to confirm that your catering team can make truly gluten-free foods for your event. 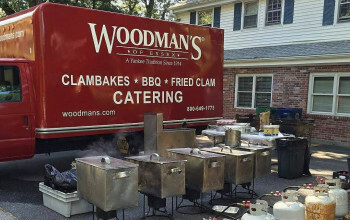 Woodman’s of Essex has a robust gluten-free menu and experience catering large events for people with and without allergies. Contact ustoday to learn more at 800-649-1773.